Hull City have had an approach to speak to Wales boss Chris Coleman about their managerial vacancy turned down by the Football Association of Wales (FAW). The 46-year-old is one of the candidates the Premier League new boys have targeted to replace Steve Bruce. Coleman guided his country to the Euro 2016 semi-finals a month after signing a new two-year contract with Wales. The FAW says everybody at the association is "fully focused" on the 2018 World Cup qualifying campaign. Bruce resigned in July after a breakdown in his relationship with Hull vice-chairman Ehab Allam. Roberto Martinez, sacked by Everton in May, and former Unites States coach Bob Bradley have also been linked with the vacancy. Bruce, 55, joined the Tigers in 2012 and led them to promotion to the Premier League twice and also an FA Cup final appearance in 2014, losing to Arsenal. 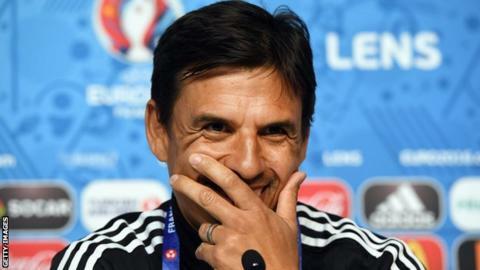 Coleman, who succeeded the late Gary Speed as Wales manager in January 2012, has already said the 2018 World Cup campaign will be his last in charge of Wales. Wales begin their qualifying campaign against Moldova at Cardiff City Stadium on 5 September. Coleman is due to announce his squad for that game on 25 August. FAW chief executive Jonathan Ford said earlier in July that he was hopeful Coleman would honour his two-year contract extension. But Ford acknowledged it would be difficult to keep Coleman if he decided he wanted to manage a club side before then. The former Swansea City, Crystal Palace and Blackburn Rovers defender has also managed Coventry City, Real Sociedad in Spain and Greek side Larissa. Coleman has been in charge of 38 game and overseen a remarkable transformation in his country's, as well his own, fortunes. He made the worst start of any Wales manager, losing his first four games, but guided his country to their first appearance at a major tournament for 58 years with qualification for Euro 2016.